Can I combine a franchise business with my existing job? 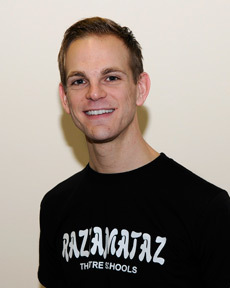 Sam Bradshaw, age 26, is the franchise owner of Razzamataz Hampstead. He wanted a franchise that would allow him to continue his existing business interest, which he has been able to do since successfully launching Razzamataz Hampstead. “Constant persistence and spreading the marketing as wide as possible has certainly been key to my success. In the London area it is extremely competitive and therefore a lot of newspaper adverts haven’t worked for me but attending events are much more successful. “One of the biggest lessons I have learnt is that it is really important to find out what works for your own individual business, and for me, that’s face to face marketing. Although I have run a business before, this is a new concept for me and I have really stuck to the guidelines laid out by Head Office. Razzamataz is a leading provider of performing arts, dance and theatre classes to children around the UK. Endorsed by Duncan Bannatyne of Dragon's Den! Since starting his Auditel business in November 2017, Ryan Harris has found his past experience in the construction industry hugely... Read More.